Treat your group to Hermann’s Old-World hospitality. Spectacular views at every turn, a charming historic district, abundant lodging and world-class wineries make Hermann the perfect venue for small- to medium-size groups. Options at Hermann’s more than 100 unique lodging establishments range from traditional motels to quaint inns. Lodging can be found in beautifully restored historic buildings, old farm houses, and luxurious facilities with first-class amenities. Each property is distinctive, with hosts who are committed to the highest levels of service and courtesy. We offer competitive group rates, payment by one check, and any level of amenities your travelers desire. If you wish, participants can be matched to specific B&B’s, where they can breakfast together, hold meetings and socialize. Located on Schiller Street in the heart of the historic district, Venue 115 at the Bank Bar can accommodate up to 60 guests. A private bar, catering packages and event planning are available. Fernweh Distilling Co. on the Hermann riverfront offers venues for small receptions, business meetings and other private parties, along with top-notch catering and bar services. Located in a beautifully restored historic building in the historic district, Hermann Crown Suites has space for wedding rehearsals and meetings. 17 themed hotel suites can accommodate up to 62 guests. The hotel’s popular Hermann 1837 Bar often has live music on the weekends. Hermann’s newest conference center overlooks the Missouri River just east of town. The Pavilion accommodates groups up to 200, while the River Room is suitable for groups up to 80. Variety of seating and table configurations, WIFI, and full on-site catering. Upscale riverbluff cottages are adjacent to meeting locations. Located on First Street, the Festhalle seats up to 350 people and is perfect for meetings, as a venue for entertainment, or antique and trade shows. Smaller rooms in this facility are also available. Across the street, the outdoor courtyard at Hermannhof Winery can seat 175 people. 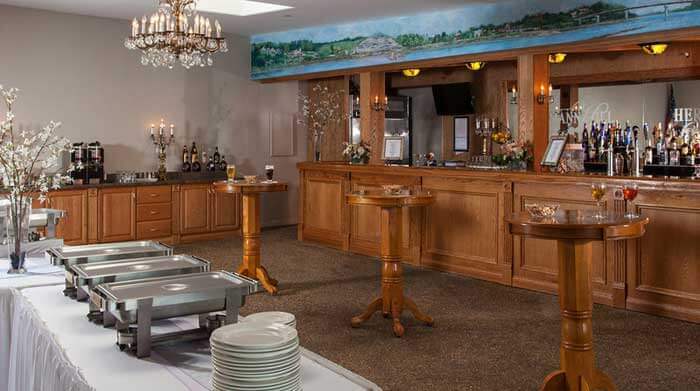 Located three miles north of Hermann on Highway 19, meeting space and food service is available for groups of various sizes; there is a 9-hole golf course. Located just outside of Hermann on Highway 100, this winery offers a spectacular view of the Missouri River on the site where internationally renowned horticulturist George Husmann established a vineyard and winery in becoming the primary influence in establishing the winemaking industry in America. A meeting room in the Husmann Wine Pavilion seats up to 60. The outdoor wine terrace has a stage and sound system and can comfortably seat 200. Located in Hermann’s historic district on 4th Street, this old time theatre is available to rent for meetings or performances. It seats up to 250 and provides a unique venue. Hermann’s most popular destination has more than 150 years of winemaking heritage, historic buildings and wine cellars. The Pavilion can seat up to 200, and the Vintage Restaurant meeting room accommodates up to 48 for lunch or dinner. Outdoor areas and smaller meeting rooms are available as well. Numerous wineries in and around Hermann offer unique settings for your group, as well as opportunities for group tours. Each winery can arrange a special activity for your group. This site captures the culture and heritage of the German people who migrated to Missouri in the mid-to-late 19th century. Two furnished houses, a barn, winery and gardens from the mid-19th century are part of the site. Special group tours are available. Built in 1871, this structure was used as an elementary school until 1955 when it was converted to a six-room museum of historical treasures. Group rates, special tours and programs are offered; great place for a reception. Swiss Meat & Sausage Company, located south of Hermann on Highway 19, is a third-generation family business. Hermann Wurst Haus is located in the downtown historic district. Both companies offer tasting and tours. Hermann is blessed with strong historic organizations whose members are always available to offer programs on a variety of topics to entertain and inform groups about the history of this area. Hermann has an abundance of quality artists who can provide workshops for groups of all sizes. Whatever kind of entertainment you want for your meeting, it can be found in the Hermann area. We have authentic German bands, accordion players, pianists, and terrific singers. An evening with Sinatra? Not a problem. Hermann has plenty of great chefs willing to share their creativity. With more than150 buildings on the National Register of Historic Places, a walk through Hermann is like stepping back in time. For those who want details, guided tours are available that focus on everything from historical significance to architecture. Tours are also available to sites outside Hermann. We will customize tours to meet the interests of your group. Step-on guides for buses are available. Save time for shopping! There are many quality antique shops, specialty stores, and all types of art galleries in Hermann. Most are located in the historic district within easy walking distance of lodging and meeting venues. Some 20 restaurants in the Hermann area offer a variety of quality food and catering services.